Armed with M-4 automatic rifles, swathed in body armor and combat fatigues, the five man U.S. Special Forces Airborne entry team stacks up outside the entrance to the house. Special Forces don't usually play games, but for their Fort Bragg training they sometimes make an exception to that rule. 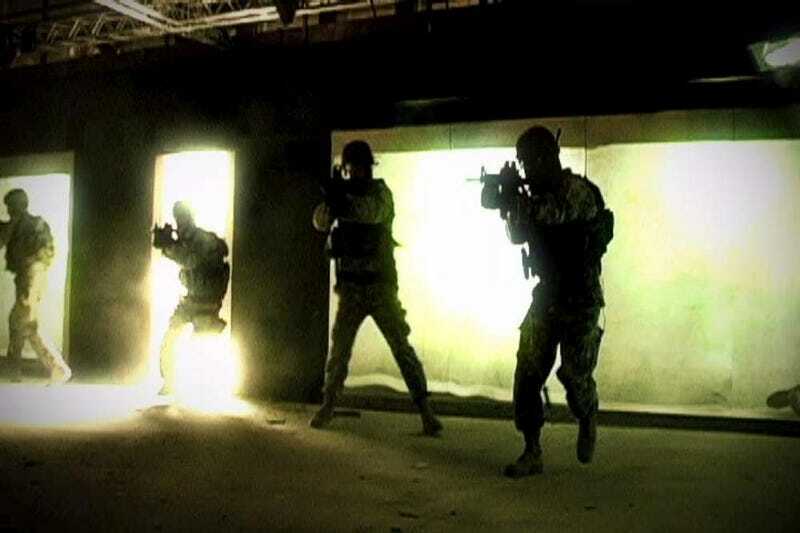 The Laser Shot Virtual Shoot House gives these specialized warriors a chance to blow in doors, fire live ammo and take out life-sized enemies, all in a real environment helped along by quite a bit of video game technology. The soldiers are deadly serious about their training. The weapons and ammo they use very real. But their opponents are life-sized video game avatars, the blood virtual, the threat they pose imagined. And the walls these digital enemies stand in front of are actually high-tech video screens that can project images and automatically seal up after a round passes through them. Based in Houston, Texas, Laser Shot has been around for about 10 years now, slowly designing more intricate, more realistic, more useful "firearms training solutions" for the military and police. But what's that mean? It means they design, develop and deliver virtual kill houses: Entire bulletproof homes created to look like bases of operation for Al-Qaeda, gang bangers, hostage takers, bad guys. Inside these homes are rooms plated floor to ceiling in ballistic tiles and covered in special self-sealing screens. Above each screen is mounted a high-resolution projector designed to throw a moving image on a wall from a very short distance without creating shadows. The whole thing is tied into an intricate network of computers that serves as the brains for the many bad guys found in the kill house. These enemies, like real world ones, are programmed to think, to see, to react. Kevin Bass, the company's director of software development, came to the world of firearms training as a video game developer about eight years ago, he tells me. "I started my career in the video game industry, working at Interplay and Souther Storm," he said. "This all seemed very similar to video games: You have virtual characters and we use a lot of the same techniques you use in the video game industry." But there are a few key aspects of what Laser Shot needs to do in their simulations that make the end result very, very different. The heart of those differences are Laser Shot's faithful devotion to the bullet and what it does when it leaves a weapon. "You can't provide negative training, your ballistics have to be accurate, everything has to be as realistic as possible," he said. "If you have ballistics that are a little bit off when a guy is shooting at a target 100 to 200 meters away, that slightest difference can make that bullet be a quarter inch off and that's a hit or miss. You don't want to train soldiers that way. "The soldier doesn't care if the flower in the grass of a video game has shadows. They care if the flower is replicating the real wind that is blowing." Bass' artificial intelligence enemies each stand about six feet tall. They know every nook and cranny of the kill house's rooms and floors. And they are motivated, motivated to stay alive, motivated to kill. "They know everything about the rooms. And they can react," Bass said. "Mostly the characters are programmed to perform certain actions, but they will act on their own intelligence too. "They will try at all costs to kill a soldier. They will run to get virtual weapons to kill them. Some have suicide vests on them." When a soldier comes into a room, they see these enemies projected on the walls, running for cover, holding hostages, firing back at them. The walls in the shoot house are also the walls between the virtual and the real when it comes to the bullets. "Once a round hits the screen it becomes a virtual round, our software takes the force, velocity and trajectory of the bullet and uses all of that information to determine where the bullet is headed," he said. "We also look at bullet drop and bullet spin." The software also factors in the inherent delay caused by the bullet going virtual and being tracked, something that usually amounts to mere milliseconds, but everything matters, Bass said. Once the bullet enters the virtual world it is tracked to see if, when, where and how the round hits an enemy. The enemies, all created to stand about six feet tall, are the product of lots of motion capture sessions and even more death animations. "We show as close to real body damage as we can get," Bass said. "You want it to be as realistic as possible. We try to show the soldier about as much as he's going to see in combat. He's going to see things way worse than that. Blood and gore, that's part of their training. They expect it." And whether you put an enemy down depends on much more than just hitting him. The computers also determine what the enemy was doing when they were shot, where they got shot, at what angle did the bullet hit, were they wearing protection. "Those are the key elements that really do separate it from a game," Bass said. "Games like Call of Duty are really cool looking, really fun, and realistic on some level, but when you get to the training level they're not really accurate." The Laser Shot shoot house, Bass said, is essentially a very detailed and complex video game. "At the heart of it, it is a video game. This is what video games have evolved too." The shoot house continues to evolve. Bass is currently working with his team on a classified project with the Navy to create the next-generation live-fire close-quarter combat training facility. The prototype for the new design went live earlier this month, he said. In this latest iteration, small tracking devices are attached to the training unit's weapons. The computer uses this information to create a virtual version of the real house and real soldiers for the digital enemies to react to, essentially turning the real world into a level in their video game world. Then it streams this new data to the digital bad guys, allowing them to know where the soldiers are in the house. "They can look at you, they can shoot in your direction virtually," Bass said. Soldiers also wear impact vests that deliver sharp thuds when a virtual bullet hits them. "When the avatar shoots, the system creates a virtual shot that it tracks going into the replica of the room in which the soldiers are standing. When it collides with their avatars it gives the vest a thump," he said. "Right now we have a vest, but we are expanding it to new technology that will allow you to add the ability to be thumped in individual zones of your body." The next iteration of the shoot houses, Bass said, will likely include even more tech, including the ability to measure the biometrics of the soldiers in real time and feed that to both the trainers and the computer and its minions of digital enemies. "The military industry has looked at Hollywood in the past to get them to the next level of training," Bass said. "Now it's time to look at video games. Soldiers need something more than paper targets to train with."